The summer cannot get here fast enough as far as I'm concerned. Not only are there several movies to be excited for, but 2012 can certainly use a shot of simple positivity. Make no mistake, we are not referring to seeing quote whores plaster themselves all over the ads for the next four months. The studios have actually done a pretty decent job in keeping their junketeer lapdogs in the basement where they keep their crap flicks. Even Peter Travers has been kept under wraps to an extent with only 14 quotes on the year (and only two more weeks to match his tally of 16 through April in 2011.) Truth be told, studios have needed some easy praise to grab this year. Out of 37 wide releases in 2012, only 10 have been reviewed above the aggregate 60% needed to score a fresh rating at Rotten Tomatoes (and that includes this weekend's The Cabin in the Woods, the 2nd best reviewed film of the year.) Nearly half of the releases are below 40%. And when the movies stink, the whores come out to play. More than half of Shawn Edwards quotes have been on "rotten" films. Five of Mark S. Allen's six quotes were. ALL seven of Joel Amos - bad movies. So with one well-reviewed film this week, one in-between 40-60% and one under 30%, guess where the whore camp is? Looking at you, Manny, he who called Red Riding Hood "haunting and mysterious." 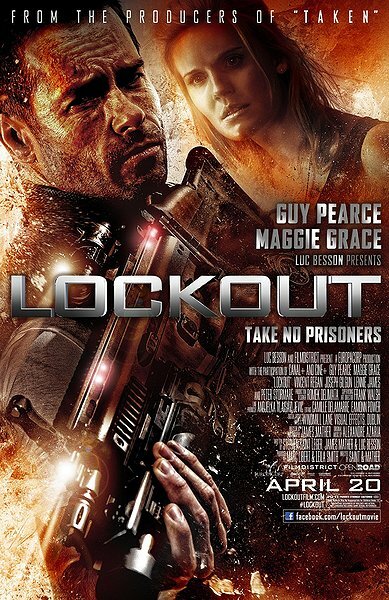 Calling Lockout "a blast" is not quite the same as those quotes, though one imagines you going "bwast, bwast, bwast" during the screening. Someone else picked up the ball from you this time, but we'll get to him in a moment. Let's look at Jami Philbrick now. If we were to eliminate The Hunger Games and Chronicle from the "action thriller" genre argument we would still be left with Haywire and The Grey to complete for "the most entertaining action thriller of the year" debate. Do we need to remind Philbrick about The Raid: Redemption or is that too off his radar? Doubtful since after all he was good enough to lend his diminiutive voice of recognition to such little gems like Dylan Dog: Dead of Night and Transylmania, two films that scored a collective 6% at Rotten Tomatoes. (Dylan Dog got all 6%). Of Philbrick's 19 quotes since 2009, 14 have been of the "rotten" variety with 11 not even achieving a 40% parameter. Who cares what he thinks was "the best crime film of the year" in 2011 (Texas Killing Fields) or that his idea of "the perfect date movie" revolves around a woman not telling her prospective suitor that she is pregnant (The Back-Up Plan). Guys, is this really who you want telling you what "the most entertaining action thriller of the year" is? Tell him to go have a 10-calorie Dr. Pepper and shut the hell up. Anyone who would take the rhyming pun path in exclaiming their love of a film, particularly one in a "professional" capacity deserves to be locked in an outer space prison. We tweeted back Open Road in the hopes they wouldn't embarrass themselves by using such a lame bit of praise. They didn't listen. "Fast-paced" is kind of Mantz's thing. It has to be if you're going to be in the game of competitive quote whoring, where the lack of any written thoughts by said whore must quickly translate into 5 or 10 whoppers that the studio can then use and attribute to someone other than themselves. But, seriously, it's kind of the thing he grips to. Not too hard to play on that last one. It's also kind of his thing. Please tell us you are kidding, Ed. Please let us in on the ruse that you mashed up, inarguably, two of the best films of their respective action and science-fiction genres in order to specifically get quoted on this film. Unlike most quote whores you write reviews. Which meant you thought that line, wrote it and let it out. I have other colleagues I am friendly with who liked Lockout, so this is certainly not about disagreement. God bless ya for liking such an unwatchable turd (sans Guy Pearce's performance), but there should be no disagreement in just how nutty that comparison is. Let's break it down, shall we? "Woohoo! After ten and a half years writing reviews, I finally feel like I've achieved something! But all kidding aside and since I know that part of the point of Criticwatch is to try to get into the heads of those who give these quotes and figure out "What on earth were they thinking?" I can let you in on a few "behind the curtain" bits. First of all, I really liked the movie, a LOT, both when I first saw it a few months ago and when I saw it again a couple weeks back. Even woke up early to catch a 10AM screening of it just to refresh my memory before interviewing the director and writing my review. Mind you, I never said that the movie was as good as either of those classics of those genre, but just that I liked how the two genres were mashed together. In fact, an alternate I gave them was "Die Hard as filtered through Blade Runner" and then gave them probably five or six other quotes. There you have it. As I told him back, the Blade Runner comparison still makes no sense. Next time try "Die Hard meets Escape From New York" just as the filmmakers tried...and failed. Miserably. "On the other hand," according to Douglas, "it opens with an interrogation scene (ala Blade Runner) and it involves world-building and political commentary through science fiction, which is certainly part of the appeal of Blade Runner... but yeah, I probably should have said 'Die Hard as directed by Ridley Scott' or something like that cause it was really more about the look of the movie and it was sci-fi than anything about the actual plot." In the meantime, I'll see you in Toronto Ed so I can give you an official Moe slap. Just like in The Three Stooges which Maria Salas says is "fun for the whole family." We're not out of the woods yet.